Episode three of Chaotic Good Podcast: Representation in Nerd Media part 2 with Timothy Black author of the "Gearteeth" series! Timothy will talk about his work as well as his upbringing in a racist deep southern family and how he broke away to be his own person! Chaotic Good is a podcast hosted by three creative gamers discussing the things they love, and how to overcome the things that stop us from focusing on building a legacy out of them. 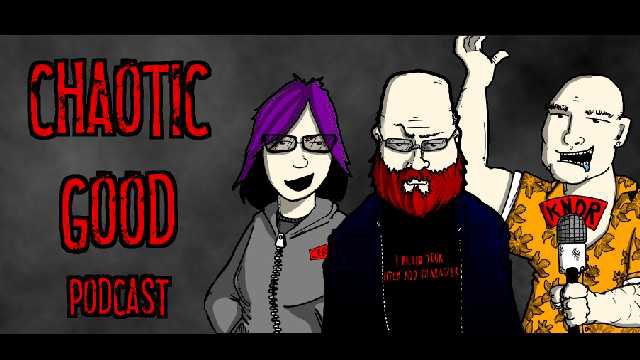 Here is more about the fine folks behind Chaotic Good Podcast! Jim Fetzer: Chaotic Good’s Producer and Engineer is Jim Fetzer. Jim decided that Star Wars, comics, and video games were a better alternative than drinking, fishing, and shooting things with a gun. Born and raised in Iowa, Jim had little to no interest in small town life. He killed time till he could leave by pursuing more nerdy interests. Despite limited access to them Jim found his escape from sheer small town Iowa boredom in science fiction and video games. Those interests stayed with him through the years as he created a background in media and sound engineering. With over 10 years of experience in audio Chaotic Good’s “Sonic Jedi” is the man behind the glass. He makes sure that Kira, Kender, and James sound like they are in the same room despite being in three different states. BEES!?!? My short novel Thieves of Fate with illustrations by James Burton will be out very soon so make sure you look for updates here and and anywhere you can follow me! Jonathan Dolbee: Who will probably never be called that on air, and that’s because James is bad at names. Since he was given the moniker Kender, Jonathan has done his level best to live up to the name. He spent over a decade as a land surveyor, exploring the countryside and making maps for whoever might be interested in them. Like most kender he has had a wide variety of adventures that have spanned both coasts of the United States, and even almost all of Ireland! He’s been hundreds of feet below ground in giant tunnel projects as they chew their way across cities, leaving behind miles of sewer and transportation lines. He’s dangled from the skeletons of high rises to ensure the bones go in the right places so that there aren’t any surprises later on. He’s managed guilds and raids in World of Warcraft, armies of every faction in Warhammer and 40k, war bands of Elves and Dragonkin in Warmahordes, and has played every class/race combination there is in 2nd edition D&D, and whored it up for that sweet xp so hard at his first Hackmaster tournament Kenzer Co. had to re-write the rules.